​The most common domesticated hedgehog is the African Pygmy Hedgehog. They're a hybrid between a white-bellied (or four-toed) hedgehog and/or the Algerian hedgehog. They're not actually bred to be smaller, like the word pygmy implies, but they're simply smaller then other European breeds of hedgehogs, thus the African Pygmy Hedgehog name. Hedgehogs are easy to spot thanks to their compact size (usually reaching 5 to 8 inches in length), the thousands of quills covering their backside (5,000 to 7,000 on an adult hedgehog), their pointy noses and soft, fur-covered bellies. Thanks to selective breeding there are many, many colors available now and even recognized by the International Hedgehog Association and many hedgehog shows. The first hedgehogs were imported to the United States in the 1980's and in 1992 there was a ban placed on importing any new hedgehogs from outside of the country due to the chance Foot and Mouth disease may be contracted, imported, and harm the United States' cattle. However, hedgehogs do not naturally have this disease so the current hedgehogs were allowed to stay and flourish under the careful and precise breeding practices done by the United States breeders. Since hedgehogs are such a newer species there is little actual scientific studies done on these animals and much of the information provided through forums and websites are 'here say' and simply whatever worked for that individual person. Even the deadly disease Wobbly Hedgehog Syndrome's cause is still unknown. It's a good idea to learn and to ask -- and then do what works best for you and your hedgehog. You can always ask your breeder or a licensed veterinarian for a little guidance on your decisions to make sure nothing you are doing and/or introducing could be harmful. - A hedgehog does not have a body odor like ferrets. ﻿and do not gnaw on or destroy things naturally. - Hedgehogs are low maintenance compared to other animals. - Hedgehogs do not have dander and are practically hypo-allergenic. pattering of feet on a wheel. not need routine shots or immunizations. entice them and one day they may want to cuddle over a movie. have been captive bred for many generations." signs telling you when they are hurt or grumpy. It's not aggression, but communicating, for them. - Hedgehogs are exotics and some veterinarians don't have experience with them. - "Hedgehogs do best in 70˚- 80˚ F temperature ranges. We have found the optimal temperature for our herd is 75˚. You must be prepared to provide additional heat sources if your house is maintained at cooler temperatures in the winter." - "The average hedgehog is naturally shy, nervous, and does not come when called, display outward affection, or perform tricks (even though there are some exceptions)." - Nocturnal animals will sleep all day unless you wake them to play. - Hedgehogs are primitive and do not understand you do not like to be defecated and/or urinated on unless you teach them different with time and patience. - Hedgehogs are solitary and only plan on one per cage. - Hedgehogs are illegal in some states and counties. - "Pet hedgies do best if handled every day, and they make take a long time to become accustomed to their new owners and environment. If possible, try to pick up the hedgehog to gauge its reaction - try to choose one that will allow itself to be picked up and maybe even turned on its back without rolling into a tight ball and staying there. But remember you are a new smell and voice so even the best babies will be a little nervous the first week or so. Look for bright eyes, clear nostrils, and healthy looking skin, quills and fur. Watch out for flaky skin, missing quills, or discharge around the eyes or nose. Also make sure the hedgehog is in good body condition - neither too thin nor overweight (a good place to check is around the legs - watch out for rolls of fat as obesity is a common problem). Finally, make sure to think about what colors you enjoy most and the fact colors will fade with age. Make sure to remember both males and females make equally good pets. ventilation. Of course, unless you're planning on using water bowls. freezer for 48 hours before using it, that will eliminate any stowaways in your bedding. - Hide-Away: Hedgehogs need more than one place to hide and they love to burrow and cuddle. Big Igloos, huts and sleep sacks are great for hedgehogs. We strongly suggest buying the Needlework Hedgehogs' Sleep Sacks; they have invisible seams to they won't catch toes and cut off circulation, they're reversible and they can be stretched out for handling and/or grabbing scared or prickly hedgehogs, they can be placed on a desk or in a lap for bonding time, and just so much more. Cheaper sleep sacks often have seams on the inside that, with wear, catch toes, cut off circulation and may lead to required amputation. - Wheel: Wire wheels catch on toenails and will tear them off, even causing nerve damage to a hedgehog's feet in the process. Only use solid, plastic wheels like Comfort Wheels. There are many wheels available from the Comfort Wheels to the Silent Spinners to the Carolina Storm Wheels so research your wheels and make sure they fit you and your pet's needs. But make sure you don't get a wheel smaller than 12" (I have tried this and wasted a lot of money) and do remember your hedgehog will defecate while running in the wheel so only get one you are prepared to clean frequently. -​ Dishes/Water Bottles: I use water bottles to supply my hedgehogs with a clean supply of water. I have used dishes in the past but they just end up dumping the dish or playing in it (even if it's heavy ceramic, which it should be if that is what you choose to use) and then you just end up with a big mess in the cage so I recommend water bottles. And some older hedgehogs may develop teeth problems after biting on the water bottle's nozzles for years but it's relatively uncommon. However, hedgehogs who are going to be in a new place (going home with you!) do need to also be offered a water dish on top of the water bottle until you can tell they are using the water bottle. A hedgehog's natural reaction to new stimuli is to ball up and/or keep their head low so their quills can protect them. I have seen babies refuse to drink out of a water bottle because stretching out and making themselves vulnerable to use a water bottle's nozzle was just not an option for them; they've dehydrated and worse. You can use a dry-erase marker to help you watch the water levels while you wait for baby to begin to drink from the bottle. And please, remember some bottles may leak and that doesn't count as drinking! - Litter Pan: This is definitely optional but some people enjoy the fact they can litter train their hedgehog. Use a corner pan (hedgehogs pick a corner to potty in) for training your hedgehog. It's as easy as placing the pan in the corner the hedgehog chooses to potty and placing whatever feces you may have to clean into the pan, along with the hedgehog. With repetition they will learn where it goes. Also, playing with the hedgehog in the pan for the first twenty minutes after waking it up can teach the hedgehog not to potty on your hands. If you do this in the pan and then reward them, they'll learn where to potty faster. - Toys: Hedgehogs love small, plush toys and balls but avoid lattice balls; feet and jaws can get stuck in them. Pipes, tubes, tunnels and empty toilet paper rolls seem to be hedgehog favorites. - Temperature: You can use ceramic heat emitters and space heaters with a thermometer (placed on the other side of the cage then the heaters, of course) to make sure you keep your hedgehog's room around 75F. Any where from 70F to 80F will do; if colder, a hedgehog will attempt to hibernate which will lower their immune system and a common cold can kill them, and with hotter temperatures a hedgehog will splat out on it's belly to attempt to cool off and can die from heat stroke. Hedgehogs have burnt themselves on heating pads so avoid them. Also, avoid anything that emits UV-anything (like UVB/UVA light) because those are designed for reptiles and have caused cancer in a matter of months for hedgehogs. To pick up your hedgehog gently scoop him up from the belly. You should feel fur and avoid the quills. And you can scoop up some bedding then gently move your hedgehog from hand to hand to get rid of the bedding. Once you have picked him up, you can have him in one hand while you other hand protects and supports from his back. Remain calm and allow give him time to relax. If he rolls up into a ball, be patient. He should calm down if agitated and begin to sniff and even try to explore you. You should not wear gloves when handling your pet. The quills do look dangerous but they are not very sharp and rarely cause injury. You want your hedgehog to get used to your smell and become comfortable around you. And remember if you smell good like soaps, perfumes, or food, you may get bitten simply out of curiosity. Smokers report that they get bit more often and this is believed to be because of the tobacco smell. Hedgehogs are clean animals and work hard at staying clean. As long as you maintain a clean cage for your pet, very little grooming should be required of you. Sometimes bedding, dirt, or other matter may become lodged in his quills, or your pet may just be dirty and need a bath. You will need towels, a toothbrush, and a sink. Shampoo isn’t always necessary and does dry skin. Fill your sink with about an inch of warm water. Do not fill the sink too deep and make sure the water is not too hot. Place your pet in the sink and wet his back with the warm water. Try to avoid getting his eyes, ears, and face wet. Take the toothbrush and gently comb his quills from front to back. Then reach under him with your hands and gently wash the fur on his belly. If your hedgehog defecates in the water, be sure to remove him from the sink when refilling it if you empty and rinse it. Check the water's temperature again before reading the hedgehog. On accident, some people have refilled it with too hot of water and scalded the animal before they realized it because they left the animal in the sink. Once the bath is complete remove your hedgehog and place him in a towel. Gently dry him and try to remove as much water as possible. A second towel may be necessary if the original towel becomes too damp. You want your pet to be completely dry before returning him to his cage. Please note: Hedgehogs create very little, if any, dander and are nearly hypoallergenic to humans. They don't need deep baths to rid themselves of dander like dogs and cats. ​Toenails are one part of a hedgehog that often need your help. Since his domesticated habitat doesn’t aid in wearing down his nails, they may become long, sharp, and need to be trimmed. The easiest way to trim a hedgehog’s nails is with a pair of human nail clippers. Gently grab one foot at a time, wait for him to relax, and then trim the nails. Your hedgehog may be stubborn, but be patient. You can also walk your hedgehog on your palms, wait for their foot to slip between your fingers, and catch the foot. If you have a particularly upset pet, you can do this during a bath. When you cut his nails, do not clip them too deep. If you cut into the quick, the pink area of the nail that is filled with blood, you will cause bleeding. If you accidentally cause a bleed, use a styptic pencil, flour, or corn starch to stop it. A nail cut too deep will bleed profusely, so take care when trimming your hedgehog’s nails. Their nails are not rounded like a cat's or dog's nails but flatter like our's. An everyday nail clipper to clip the white portion of the nail (just like yours) is fine. Keep in mind the quick is a nerve and it is painful when it is clipped, not just a profuse bleeding place. many years. Read the labels for high protein and no corn, byproducts or dye. more expensive on the shelf. foods contribute to cancer, kidney disease, birth defects, and liver disease. ﻿Everybody loves junk food and your hedgehog is no exception. Treats are a great way to add variety to his diet, but should be fed in moderation. Insects like crickets and meal worms make great treats. Other choices are moist cat or dog treats, and cooked foods like eggs, turkey, and chicken. Try to avoid BHA's and BHT's for the same reason we avoid them in cat foods. Baby foods do not have those preservatives in them and are a great way of making sure any treat is not too large for a hedgehog. They love baby foods! And freeze-dried insects have blocked and clogged hedgehog digestive tracts before so here's some acceptable live insects for hedgehogs: crickets, silk worms, butter worms, wax worms, meal worms and flightless, shell-less cockroaches. Avoid those big Super Worms, not only because they're grown on hormones, but because if it is not 100% dead when hedgehog excitedly gulps it down, it can eat it's way back out of the hedgehog's stomach. Always avoid the following: corn, grapes, raisins, onions, bird seed, nuts, chocolate, caffiene, avocado, citrus anything, tea tree oil (some breeders use this in their shampoos but some say it has hurt their hedgehogs so I avoid it to be safer than sorry), aloe, ethoxyquin, bread, raw carrots, celery, tomatoes, hot dogs, bologna, raw meats or fibrous meats. Polysporin and Neopsporin pain relief or extra strength is toxic to your hedgehog. Don't smear it on an injury yourself and let a licensed veterinarian make the calls with any injured animal. If you choose to give your hedgehog dairy products to it very sparingly and rarely. Hedgehogs do have a very mild lactose intolerance level but many owners and breeders give them a rare treat of shredded cheese, low-fat yogurt or low-fat cottage cheese with no problems. Just remember the low-fat part! ​1) Diarrhea/Green Stool: It is common, if not standard, for hedgehogs to get diarrhea, green, mucous, and all around yucky stool during their first week in a new environment. This is generally caused by stress and sudden diet changes and can happen throughout the hedgehogs life. What you can do: Avoid any changes in your hedgehog’s diet the first week home. Try to make sure your hedgehog’s environment is as stress free as possible by reducing loud noise, handling, etc. What to watch for: Blood in stool may indicate serious bowel disturbances. Blood may appear red or black, not to be confused with the normal dark brown of hedgehog feces. It is in your hedgehog’s best interest to be seen by a veterinarian immediately if blood is found in the stool. ﻿2) Decrease in Food Consumption: It is very common for hedgehogs to decrease their food intake during the first week home. This is generally due to stress and most will resume eating normally within a few days. What you can do: Do not make any changes to your hedgehog’s diet during their first week home. During the first few days, count the number of pieces of food you put in your hedgehogs bowl and count them again at the next feeding to see how many pieces your hedgehog has eaten. This will help you to monitor their eating habits. Offer your hedgehog snacks such as mealworms or crickets, but do not offer enough to replace a meal. 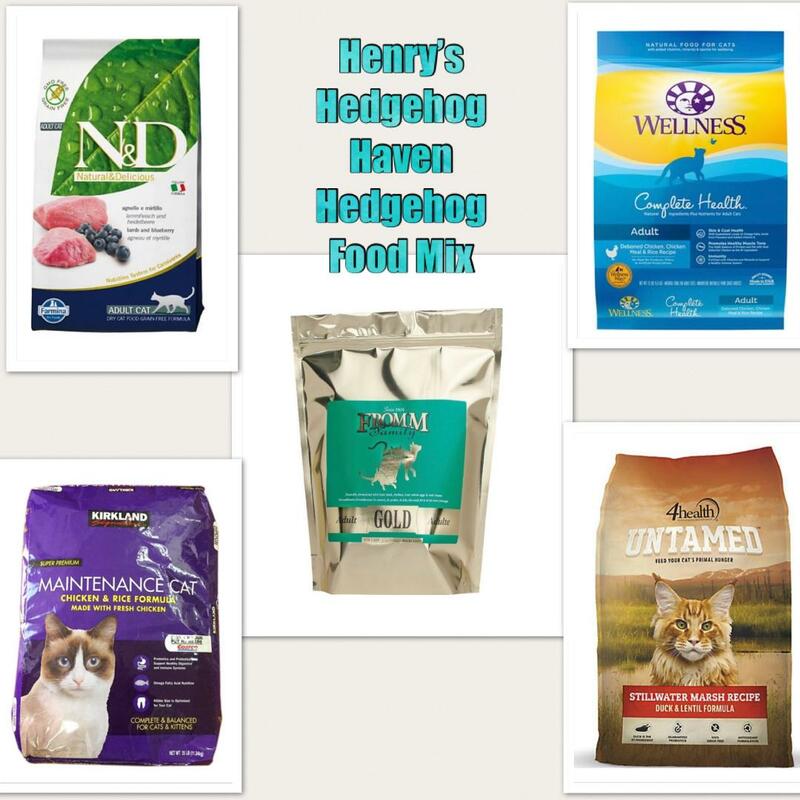 Many hedgehogs will resume eating if you sprinkle their food with powdered freeze dried chicken liver. Hedgehogs will often quit eating if they are dehydrated or not drinking enough water. and your veterinarian should be contacted immediately. ​3) Decreases in Water Consumption: Hedgehogs rely heavily on their sense of smell. A sudden change in their source of water may cause them to stop drinking altogether. Do not expect your hedgehog to drink an entire large bowl or bottle of water. What you can do: Monitor your hedgehog’s water intake closely. Mark the “starting point” when you first fill the water or bowl with a non-toxic, dry-erase marker and check the levels daily, taking into account the tendency for evaporation in water bowls and dripping in water bottles. If you notice very little or no difference in the levels for more than 36 hours, you need to contact your veterinarian. What to watch for: Pinch the skin on your arm for a few seconds and let it go. If you are well hydrated, it should pop back into place almost immediately. This is called your skin turgor. The skin of a well hydrated hedgehog will do the same thing. If you notice your hedgehog’s skin takes a considerable amount of time to pop back into place, he or she is probably dehydrated and you should contact your veterinarian immediately. If it has been 48 hours or more since your hedgehog has consumed water, please contact your veterinarian immediately. 4) Sleeping: It is very normal for hedgehogs, especially young hedgehogs, to sleep a lot. You must remember that they are nocturnal and like newborn babies, they do require a lot of rest. What you can do: Make play time rewarding. Like humans, hedgehogs may not like being woken up out of a sound sleep. Wake them up slowly and quietly and allow them to realize what is going on. Offer them a treat for the inconvenience. This is a great time for them to get their fiber from a mealworm or a cricket! What to watch for: If your hedgehog does not seem to wake up “normally”, look for these things: A cold belly, “wobbling” after the initial few steps, or any kind of “out of it” reaction. This may indicate a hibernation attempt that must be addressed immediately! (A hedgehog wobbles if anything is wrong with it, such as temperature, dehydration, an illness, so do not automatically assume Wobbly Hedgehog Syndrome and worry.) If your hedgehog is experiencing any of these symptoms, please start slowly warming your hedgehog by holding them on your skin under your shirt and contact your breeder and veterinarian immediately. DO NOT try to warm them up quickly! If your hedgehog has not been eating or drinking and is experiencing these symptoms, you should also contact your veterinarian for further analysis and instruction. Finally, keep in mind if they are cold then their digestive tract has slowed down and they should not be force fed anything. 5) Behavioral or Personality Changes: It is common for hedgehogs to go through grumpy periods. Like humans, they have their good days and their bad days. Stress, quilling, diet changes, and illness can all play a part in your hedgehog’s behavior and mood. Most babies will be very huffy during their first two weeks in their new environment. They may quill up, pop at you, make huffing noises, and although it is rare, some may even bite if agitated enough. This is not to be confused with “tasting”. Many hedgehogs will “taste” you because they do not know who or even what you are. When a hedgehog “tastes” you, they are usually fairly calm. They may first begin by licking and follow with a bite and reasonably quick release. This will often be followed by an episode of self-anointing. They will cover themselves in a frothy spit and then may return to have a second go at whatever it was they just tasted. This is not a behavioral problem and will continue throughout the hedgehogs life when they encounter something a new smell or taste that they enjoy. What you can do: Try to keep their environment as stress free as possible by reducing loud noises. How often you handle your hedgehog really depends on their personality. We do not suggest leaving a cranky hedgehog alone simply because they are cranky. They must learn to trust you and will not be able to do so if they are never handled. Quilling will often lead to a very cranky hedgie. Putting a few drops of olive oil or vitamin e oil on the hedgehog’s skin will relieve some of their discomfort and help prevent them from scratching; therefore preventing any related skin infection. Hedgehog “tasting” and biting is often brought on by new scents; hand lotions, soaps, perfume, food, and cigarette smoke are only a few of the things that may cause this. Hedgehogs seem to be particularly sensitive to smoke and many will experience personality changes that reverse themselves once the hedgehog is removed from a home where their owners smoke indoors. What to watch for: Sudden mood swings can be brought on by illness and pain. It is important to monitor the other aspects of your hedgehog’s behavior and note any sudden changes in bowel movements, sleeping patterns, or eating and drinking habits. If something in your hedgehog’s behavior seems “off”, please contact your breeder and veterinarian for further advice. No matter how long you have had your hedgehog, it is important to check them daily for any of these issues. If you have any questions, please consult your breeder or licensed exotic veterinarian. This information is not a substitute for veterinary care and advice. If you feel your situation is an emergency and that your hedgehog is in immediate danger, please do not hesitate to take them directly to your veterinarian! If your veterinarian is unfamiliar with hedgehogs, you can let them know there are many dosage charts for hedgehogs available online that can help guide them in making their professional decision. I would like to say a BIG Thank you to Kat Austin from Happy Hogs for giving me permission to use this information.